**IMPORTANT UPDATE** The Silencing Act has been overturned! But the Speak-In is still happening. Join us May 4th to celebrate this victory and to protest all the policies and institutions that work to silence people in prison. You can read our statement on the Judge's ruling here. 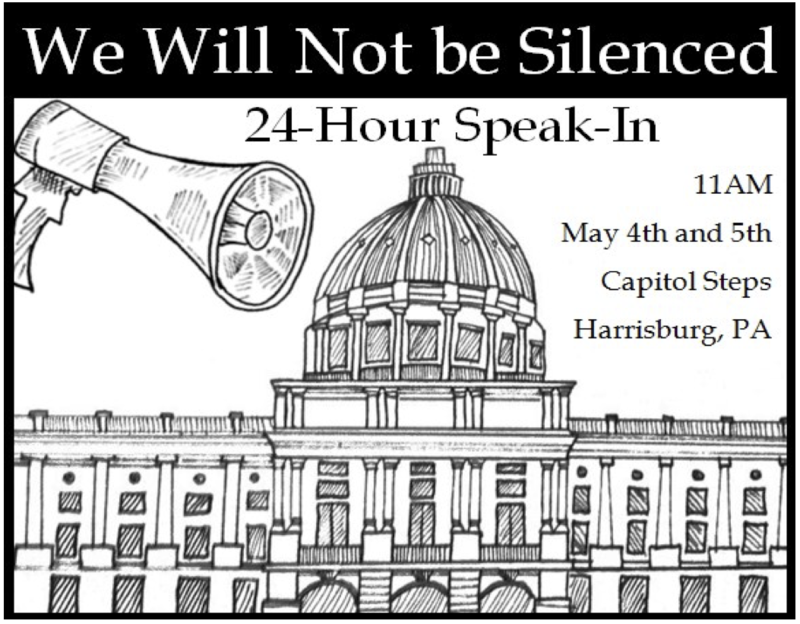 On May 4th, Decarcerate PA and our allies will travel to Harrisburg to take a stand against the Revictimization Relief Act, a law designed to silence incarcerated and formerly incarcerated people. Join us on the Capitol steps as we share the words and ideas of people in prison and others who are potentially impacted by this law. From 11-2 we will be having a large rally on the steps of the capitol. Those who are only coming up for the day will return to Philly, and folks who are staying will spend the rest of the evening reading the words of people in prison, writing letters, and discussing how to fight repressive laws like this one. SUBMIT: Do you or someone you know want to contribute something to be read at the protest? Check out the Call for Submissions here. To the legislature, we say: Repeal this law! To Governor Wolf, we say: Take a stand against this law by asking Attorney General Kathleen Kane not to defend it in court! To the Department of Corrections, we say: Stop all forms of silencing prisoners! Allow the media full access to DOC prisons, stop mail censorship, don’t restrict people’s visitation rights, and cease all retaliation against individuals who speak out in protest! SPREAD THE WORD: by email or sharing the event on facebook. LEARN MORE: The Revictimization Relief Act, also called the “Silencing Act,” was introduced by Representative Mike Vereb and rushed through the legislature during Governor Corbett’s final days in office. The bill was introduced in response to political prisoner, writer, and activist Mumia Abu-Jamal’s commencement speech at Goddard College, and is a clear attempt to silence Mumia and other prisoners and formerly incarcerated people from advocating for their human rights or participating in movements for social change. The law allows victims, District Attorneys, and the Attorney General to sue people who have been convicted of “personal injury” crimes for speaking out publicly if it causes the victim of the crime “mental anguish.” This law is so broadly written that seemingly any statement, no matter how unrelated, could be construed as causing “mental anguish.” And it can apply to any form of public speech: from a commencement speech to an interview on the radio to a letter to the editor. Read "Rights of the Condemned" for analysis of this law from David Lee, a prisoner at SCI Coal Township. We believe this legislation is not a genuine attempt to help victims, but a cynical move to stop people in prison from speaking out against an unjust system. The bill was pushed forward by the Fraternal Order of Police, passed by cowardly legislators, and signed into law by an unpopular Governor hoping to mobilize right-wing voters on Election Day. If this law is allowed to stand, it will be a huge blow to the movement against mass incarceration. People behind the walls play a leading role in these struggles and provide analysis, perspectives, and strategies that are essential to this work. Incarcerated and formerly incarcerated people who speak publicly, write books, contribute to newspapers, or testify about prison conditions run the risk of being criminalized simply for sharing their ideas. Already two lawsuits have been filed in Federal Court to try and overturn this law on constitutional grounds. Both legal teams have filed preliminary injunctions to try and stop the law from being implemented. But the fight against this law won’t just be waged in the courts. We also want to send a clear message to Governor Wolf and the state legislature: For years, politicians have rubber-stamped repressive legislation like this without any fear for their jobs--but those days are over. That’s why on May 4th, we will stand on the steps of the capitol and share the words of incarcerated and formerly incarcerated people. Through this public act of civil disobedience, we will defy the Silencing Act and show that unjust legislation like this will never hold our movement back. We’ll also highlight the profound contributions that people who have been and are imprisoned have made to our culture, our literature, and our social movements. Finally, we expect to bring nationwide attention to this issue as we build momentum not just to repeal this law, but to dismantle mass incarceration altogether. The politicians who passed the Silencing Act are doomed to fail because they do not understand that prison walls aren’t strong enough to keep the truth locked away. The very fact that they created this law is a sign that they are frightened of what people in prison have to say. Together, inside and out, we all must raise our voices against the rotten system of mass incarceration and demand real change. From Ferguson to Philadelphia, resistance is rising against mass incarceration, institutionalized racism, and police brutality. Change is in the air, and no one’s voices are more critical to hear in this moment than those of incarcerated and formerly incarcerated people. Our movement can’t be contained by walls or laws--and we’re going to make sure Harrisburg knows it. JOIN US May 4th. Need help getting to Harrisburg and back? Planning to stay the night? This event is cosponsored by the Youth Art and Self Empowerment Project, the Human Rights Coalition, Books Through Bars, X-Offenders for Community Empowerment, The Center for Returning Citizens, and the New Sanctuary Movement.